Ideally located for the River Thames and Pimlico Underground this light one bedroom apartment is set on the first floor (with lift access) and a separate fitted kitchen. Drummond Gate is ideally located with a communal garden with a stunning water feature and offers easy access for Pimlico Underground while Wilton Road and Westminster are within walking distance. 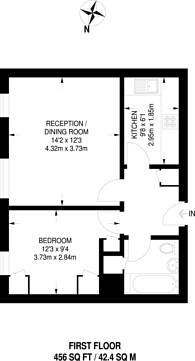 456 (42 Sq M) approx.